JD, yes, I was reluctant to mention the exact location owing to the Badgers, and their habit of attracting negative attention. Necrodes littoralis, a species of large carrion beetle, found at Ardeer Quarry Local Nature Reserve today. It’s an uncommon species in Scotland, much less common than the similar-looking Necrophorus humator. The two species are told apart by the former’s bow-legged appearance and relatively thin antennal tips (the orange tips of the antennae are swollen/clubbed in N. humator). Both species seek out dead animals on which to lay their eggs and feed their young – they can smell carrion from over a kilometre away. However, whereas N. humator tends to seek out small corpses such as mice and birds, N. littoralis prefers larger carrion. They’re attracted to light and so I often encounter them when I’m using UV lights to survey moths. A Large Emerald moth on the Ardeer Peninsula last month. This is the largest green moth found in Stevenston - it's the size of a large butterfly. It’s caterpillars are Birch-feeders, so I tend to catch it in Birch woodland, usually on the Ardeer Peninsula. Here's one for Ian. This unusual fly was crawling about my window this morning,Maybe Ian could identify it. 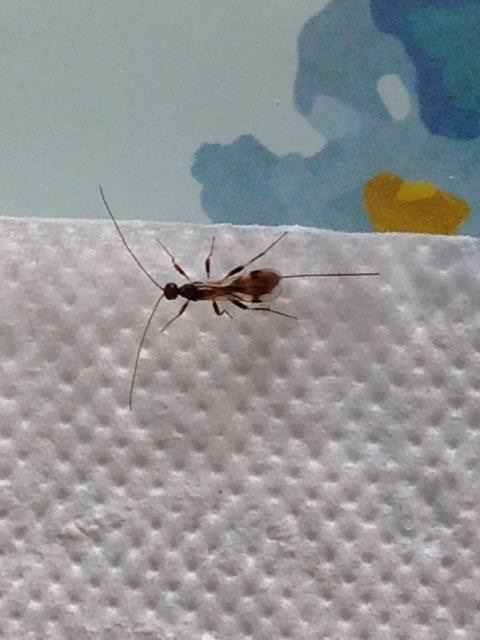 Hi Chriso, this is an ichneumonid, a type of parasitic wasp - i.e. a wasp that lays its eggs in other insects. The long, sting-like thing sticking out its rear end is an ovipositor for laying its eggs. There are about 2500 species in Britain. They're notoriously difficult to identify to species, even under a microscope, not least because no identification keys yet exist for some of the families! 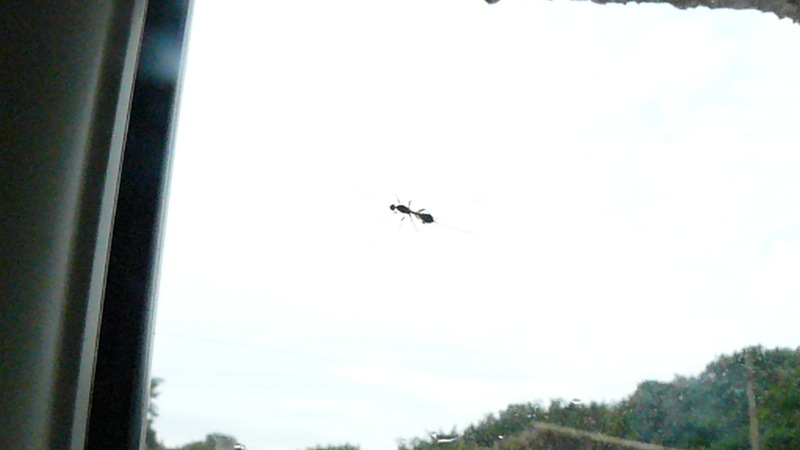 Thanks Ian, I thought at first it was a flying ant, till I saw the length of the sting like thing. A Beautiful China-mark micro moth on the Ardeer Peninsula a few weeks ago. China-mark moths are unusual in that their caterpillars live under water, feeding on pond weed. There are three species of china-mark moth found in Stevenston. Brown China-marks are the most abundant, and Small China-marks are the rarest - both locally and in a Scottish context. 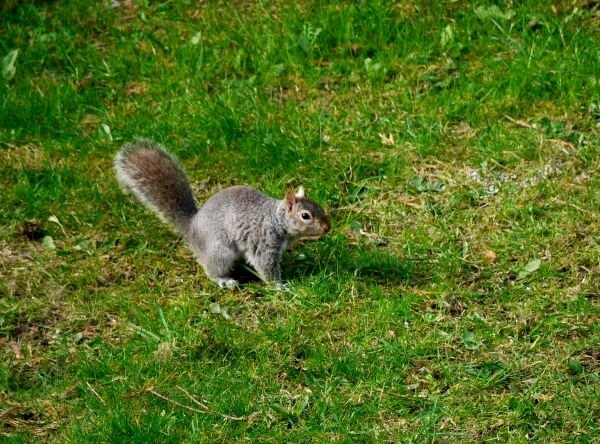 Snapped these photo's of a Squirrel in my neighbours back garden in Stevenston a couple of years ago. 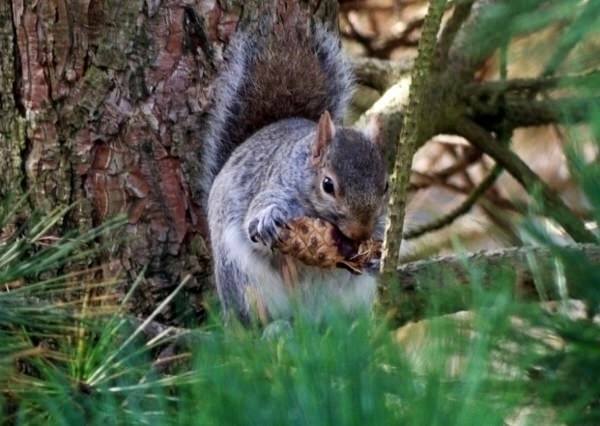 As well as being attracted by the Bird Feeder basket's it also enjoyed munching into a Pine Cone or two. I'm aware that the 'Greys' aren't very highly thought of here and for good reason .. but they're still cute! A large Fox Moth caterpillar on the Ardeer Peninsula a couple of weeks ago. They’re just about ready for hibernation. After they emerge form hibernation in early spring, they’ll soon pupate, before emerging as adults in early summer. The caterpillars are much more commonly seen than the adults, despite the fact that the males are day-flying. I most often encounter the day-flying males in prime Fox Moth habitat - i.e. heathery habitats, such as Fairlie Moor or the large peat bogs out by Auchentiber. A Great Spotted Woodpecker at the edge of Ardeer Quarry Local Nature Reserve today. They breed on the reserve and are commonly seen there in autumn and winter too, especially if you recognise their bounding flight as they move between Ardeer Quarry’s woods. Thank you for posting these photos, love them.